As Peter Fuller, one of the most controversial art critics of all time, prepares for fatherhood by going through psychoanalysis to overcome his demons, escaping the shadow of his evangelical father, he develops a friendship with the Revolutionary art critic John Berger, which changes the course of both their lives. Through art he was able to work out his demons, find peace within and lead a new movement in art history, before his life was tragically cut short in a car crash in 1990. 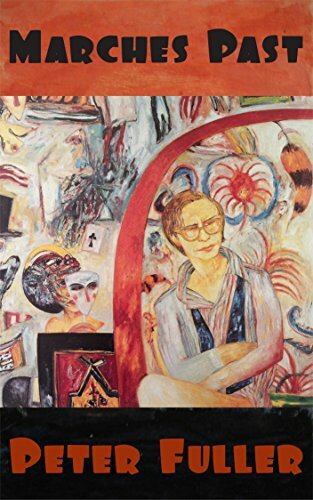 It has been a quarter century since my father, the intense, unique and troubled art critic Peter Fuller passed away in a car accident in 1990, below is my tribute to him and my growing research for a film based on his journals. As part of the extensive research I am undertaking for this project, I'm publishing some of my findings here and on my blog. Developing this project has had a deep affect on me, challenged my personal beliefs as well forming a relationship with the father I never had. The TATE archive were incredibly generous recently letting me in to dig through the archive and find out in all the secrets buried in his many journals, letters and correspondences. As it happens, I agree with Gilbert, one of the contributors to Oscar Wilde's famous dialogue, The Critic as Artist, who argues that higher criticism is 'the record of one's own soul'. He goes on to describe it as 'the only civilized form of autobiography, as it deals not with the events, but with the thoughts of one's life; not with life's physical accidents of deed or circumstance, but with the spiritual moods and imaginative passions of the mind'. Peter died in a car accident 1990, I was in the car, as was my mother Stephanie Burns she survived but my baby brother Gabriel did not. With a broken hip my mother pulled from the broken wreckage and saved my life. I personally happen to agree with Ivana Chubbuck when she said "Discovering and understanding your personal pain is an inherent part of the acting process... Aristotle defined the struggle of the individual to win as the essence of all drama. Overcoming and winning against all the hurdles and conflicts of life is what makes dynamic people". Or the painter Enrique Martinez Celaya "Your strength as an artist does not have to come from your best qualities or gifts. An artist can rise from a deficiency within himself." There were a number of controversial philosophical stances my father took. In a move that completely rocked the art world turning from Modernism to the British Tradition, my father did a complete 180 on all of his philosophical beliefs, the one thing that he maintained an undying allegiance to was real art. The extent of his tenacity as a socialist critic in the 60s and 70s was completely counterbalanced by the spiritual crusade he traveled in the 80s up until his passing. In the clip to the left the notorious art socialist critic Waldemar Januszczak debates Peter about the exhibition "The Last Romantics" held at the TATE in 1990 and the surrounding ideas. The first film I wrote, produced and acted in about the art world was in 2008, a short called Possession(s) for ABC Australia. You'll notice in the trailer Ways Of Seeing's unconscious influence. My character undergoes a disillusion with the value (material and emotional) of a painting by Australian artist Peter Booth over the course of the story. He ends up ripping the painting to shreds destroying its object value, therein seeing its true value. I was 20 at the time, today I see it a bit like a sapling of this project, not directly in terms of the story but connected none-the-less . At this point I'd like to make available the new Kindle edition of Marches Past, his brilliantly quirky memoirs, as an insight into his inner workings. The creative exploration of abstract philosophical thoughts, power struggles with his psychoanalyst, intertwined with art and axolotls. Please contact me if you'd like to receive a review copy. To understand the story of Peter Fuller, it is vital to take into account the community in which he was writing; his friendships, the perceptions of the people around him, who cared about him, fought him, fought with him and loved him in spite and because of all his unusual failings. So I'm putting together a timeline below of my research, which will serve as a backdrop. As I delved into this work I realised that it should be shared for free for everyone. The following quotes and stories are taken from obituaries, Peter's writings, archival material and occasionally recollections that have been imparted to me recently, this is not a polemical piece and takes into account all points of view. I use their words here with respect and compassion. There have been many brilliant artists over the years who have beautifully or hilariously captured the eccentric figure of my father, I'd like to share some of them here, if you have any more you'd like to share please do not hesitate to contact me. Although a key figure in the story of British art, Peter was born in Damascus in 1947, his parents Marjory and Harold were stationed there as his father worked for the Red Cross. His sister Ruth was born in Nazareth in 1945, and his brother was born on their return to London in 1950. The majority of Peter's childhood was spent in Eastleigh, a small town on the Southern most tip of England. The family lived in a Victorian house that was built on what was once an orchard. As the son of a devout Evangelical baptist father, he attended the Union Baptist Church every Sunday. Our family comes from a long line of Evangelical Baptists notably dating back to Andrew Fuller who was one of the founding members of the Baptist Missionary Society. The Andrew Fuller Centre has since used passages of Peter's book "Images Of God" in their studies at The Southern Baptist Theological Seminary in Louisville Kentucky. Which is surprising to me as the book is atheist literature, proposing a secular spiritualism in art divorced from God. Never-the-less incredibly baptist. So baptist in fact Harold Fuller led a provincial revolt amongst the congregation of the Union Baptists Church, walking out mid-service accompanied by a number of the flock, over a theological dispute with the minister. Peter was baptized upon confession of faith by complete immersion, in 1961, just before he went away to boarding school at Epsom College. "When a student in Cambridge Peter could be a bit of a dandy - even if a dishevelled one . He wore slightly old-fashioned clothes and a hat. I am not sure but I feel he had a walking stick at some point, one of those Victorian gentleman’s accessory - purely for effect. He used to be invited to parties with his roulette wheel so people could gamble … That was his “decadent” phase ! Him and some of his friends were reading Huysmans. The book was called 'A Rebours'. As a young man Peter was involved in the radical 60s Socialist movement in art, after some time he found it difficult to justify the sort of art that he liked without some sense of spirituality (however secular). When in 1977 Herbert Marcuse's essay "The Aesthetic Dimension" was posthumously published, Peter adopted the phrase as his own and become one of the only aesthetic philosophers on the Left. As the years went on he saw that this 'aesthetic dimension' was the one area where Left and Right could unite. He was one of this of that generation of intellectuals to see the flaws in Marxism and wrote publicly about them finding a new view of British art through it. This caused a huge amount of controversy amongst his colleagues. Like many people coming of age in the sixties in England, Peter was a part of the subversive movements in culture in the West. As the new wave was breaking new ground in New York, the 60s art world in London was booming, Peter and his mentor at the time John Berger were the Socialist art critics of their day. In Minotaur Surprised while Eating of 1986-7 the beast, half-man, half-animal, is shown devouring a joint of human flesh, morsels of which hang down from his bovine jaw. He glances out at us with a look of apprehension in his piercing eyes, which seem as human as his hands. In honor of the Frank Auerbach's major retrospective currently on at the TATE in London, which runs until March 2016, I'm publishing here some of my father's articles on Auerbach. During the 80s Peter referenced Auerbach as one of the best British of the 20th Century. It was because Auerbach looked out at the world, transformed it with his imagination into a beautiful experience unique only to him and gave us a window to that experience on the canvas "The Aesthetic Dimension". "A fuller, says Webster's dictionary, is one who scours, cleanses and thickens cloth in a mill; it was attitudes to art that Peter scoured and cleansed, deepening and weighting our response to its potential for spiritual power. He was the Ruskin of our time. He was unique and fascinating combination of enfant terrible and Grand Old Man - both at once. He was child in the directness of his vision. When the Emperor of Art went naked, other critics might be deceived, but never Peter: he saw and commented with unnerving pungency. But his commentary had a maturity of balance and expression, was weighty with deep reading lightly borne. He could infuriate those who thought differently, but for Peter this fury was intended as cathartic, and motivated solely by a desire for the truth. He believed to his depths that art mattered, that it held within it a means of enlargement of heart for us all; his sheer love of what he spoke and wrote about gave his views their force. Even more was his understanding of art as a search for the spiritual, as redemptive. His love was a moral passion. It was God he sought so single-mindedly, a God in whom he longed to believe but could not. The last time we were together, I told him I thought he was very close to God, but did not yet know His name. He gave me that singularly sweet smile of his, and replied, 'So you say, Wendy, so you say'. Not long after this meeting they were engaged to be married. "In February 1984 I was invited by an artist to go to some talks headed and organised by David Bromfield. There was this voracious, what I thought young, British art critic. I continued going to the seminars which finished at the beginning of March, and then this young art critic was giving his own talks for another two weeks. I became more and more interested and noticed that he was picking me out in the audience. The day of his Ruskin lecture, I decided to stay at the very side of the auditorium to see whether he really was noticing me. He walked in in his usual shy way, put his lecture down on the stand, looked up, flicked back his fringe and glanced over the whole audience with a serious look on his face, until he suddenly caught my eye. He smiled and looked down at his lecture. One of the most important things my mother ever taught me was how to love nature. Reading back on several of my father's essays she may have seen it as her duty. Not how to explain it, but how to feel it. I'm learning so much everyday about my father, I almost feel like he was just a box in my closet up until now, as his archive is now available to everyone at the TATE, we might consider that he is a box in the art world's closet full of pandora like secrets and treasures containing answers to the enigmatic mystery of not just the man, but the art world, counter culture and ourselves.